PISCATAWAY, NJ — Indiana loses seven straight in the Big Ten. Rutgers wins back to back in the east coast against the Hoosiers as they win 66 to 58. Indiana is currently averaging 55.2 in their last five games. There are things in life that are just not meant to happen. In 2019 that just happens to be Indiana having the ability to open halves efficiently. Outside of the Rutgers Athletic Center may have been freezing and in tundra-like conditions, but Indiana was anything but cold to start the game. That cold caught up in the second half. IU dug themselves into another ever so familiar hole where they spent the rest of the game trying to pull themselves out. IU started the game off well, but then things came to a screeching halt. A 10-point lead for Indiana absolutely deteriorated into what ended up being a 12-point lead for Rutgers. Romeo Langford led the team in an opening act that put the Hoosiers up 21 to 12 on the Scarlet Knight’s home hardwood. Langford showcased his versatile offensive skill set knocking down a three, finishing a hard lay-up, and scoring at the free throw line. At the end of just the first-half, New Albany’s star posted 8 points, 3 rebounds, 1 assist, 2 steals, and 1 block. Archie Miller knew he had to emphasize offense and the message was clear. Use Romeo and use him for everything. Nearly every possession was brought up by Robert Phinisee and even more possession included Romeo touching the ball or finishing. In the first half, the secondary support came from his front court captain Juwan Morgan. Though not as dominant as he has shown he is capable of being, Juwan proved to be more than a tough match for Rutgers interior players. While Indiana’s team captain played great by typical standards, he has yet to find his dominance in this recent set of Big Ten games. The peak came during the non-conference slate. With the continual depletion of team members, the Hoosiers had an opportunity to showcase the rotation more than previous games. Damezi Anderson received the most minutes from Archie tonight and he was able to convert that to 3 rebounds and not much else. Though he did not shoot particularly well, he showed more control over the ball, likely contributing to the trust the staff had in him. Tonight, he facilitated. Clifton Moore has become the topic of a lot of fan conversation and he showed tonight that he is starting to be able to put in sufficient minutes. Even if he did not leave a stamp on the game per se, he at a minimum served as a very capable backfill for Juwan. And quite honestly that’s what the team needs right now. Jake Forrester for the first time this season got almost 10 minutes of playtime, but the streak in the second-half forced Archie to play his aces for much longer than he wanted. He also did not score. Production from Rutgers came from the usual suspects on their side. Sophomore guard Geo Bakerreturned nightmares of Indiana’s early Big Ten exit in 2018 with his shooting display tonight. He finished with 10 points on the game and a perfect 2 of 2 behind the arc. Front court pair Eugene Omoruyi and Ron Harper Jr. both ended the night in double figures alongside Geo. Omoruyi’s double digit rebounds tallied another double-double for the Rutgers forward. Throughout the night, the two took advantage of the match ups whenever Juwan did not occupy the paint. 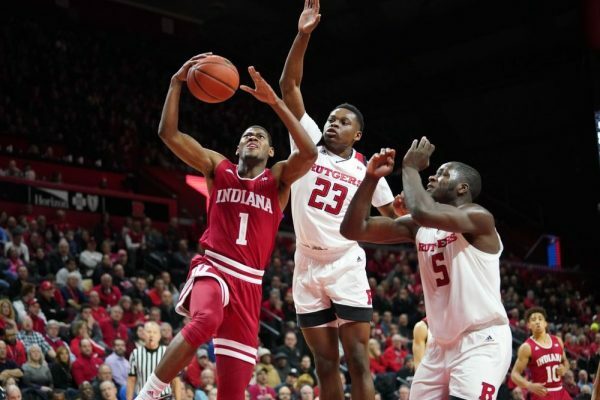 Ultimately Rutgers joins a slew of other teams that have been able to take advantage of Indiana’s poor offensive performances and now leads Indiana in the Big Ten standings. Archie Miller, Al Durham, and Romeo Langford. The road does not get easier from here. Indiana will pay the Spartans a visit in East Lansing where the Hoosiers have historically not performed well against Tom Izzo. The game has been announced recently to start a 6:00 pm EST and will be broadcasted on ESPN/ESPN2. Michigan State will also be hosting ESPN’s College Gameday.